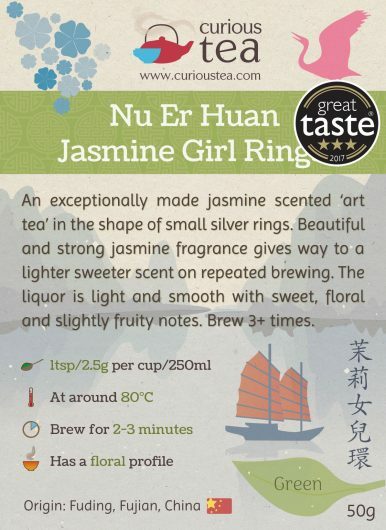 Nu Er Huan Jasmine Girl Rings is an exceptionally made jasmine scented ‘art tea’ in the shape of small silver rings. Beautiful and strong jasmine fragrance gives way to a lighter sweeter scent on repeated brewing. The liquor is light and smooth with sweet, floral and slightly fruity notes. 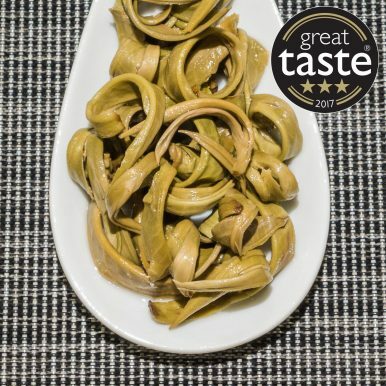 Nu Er Huan Jasmine Girl Rings green tea from China, winner of a 3-Star Great Taste Award in 2017. 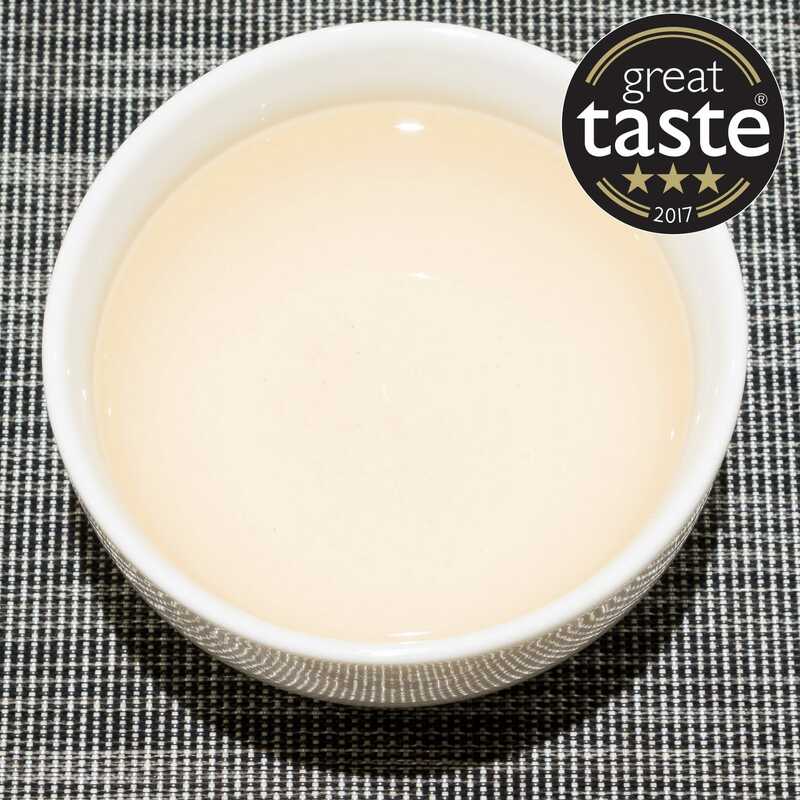 Jasmine Nu Er Huan (茉莉女兒環) is an organic scented green tea that is grown in Fuding, Fujian Province and then scented and finished in Guangxi Province of China. 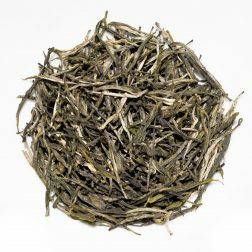 The name of this tea, which translates from Chinese Nu Er Huan as Girl(‘s) Ring or Daughter(‘s) Ring, comes from the shape of the dried leaves. 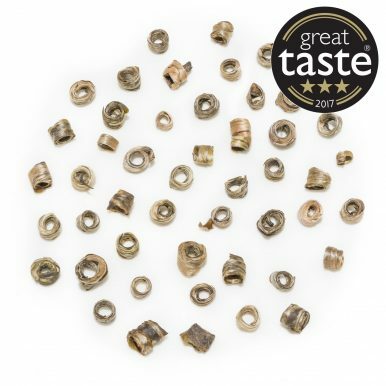 They are hand formed into little silver rings, which are reminiscent of small delicate bracelets or rings worn by girls. Jasmine Girl Rings green tea is classified as an ‘art tea’. 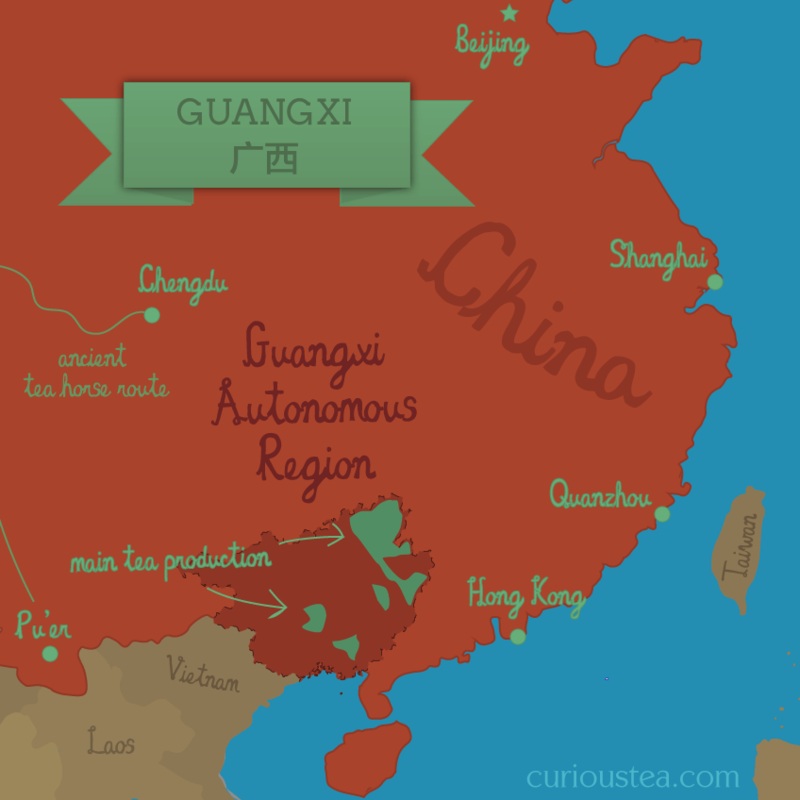 Art tea in China traditionally served the purpose of visual entertainment and was not necessarily designed to be drunk. 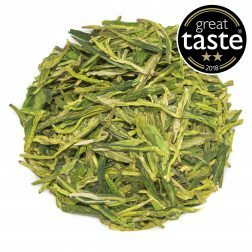 This one however, is not only pretty to look at but also produces a very satisfying cup of jasmine green tea. 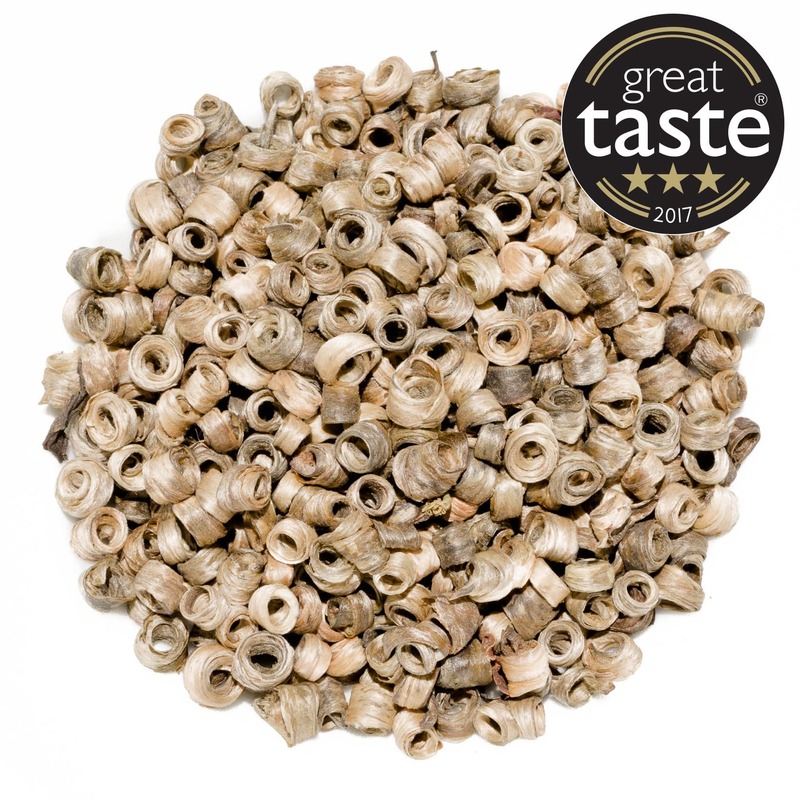 That’s why we suggest you brew this Jasmine Girl Rings green tea in a glass teapot or infuser cup to enjoy the unfurling tea leaves! 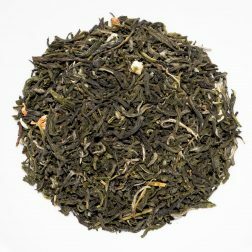 The production process follows a classic jasmine green tea recipe of scenting the tea leaves with jasmine blossoms. The processing starts with hand plucking the choicest buds. These are shaped by hand into small rings and then undergo the scenting process. This involves layering the tea leaves with fresh jasmine blossom in alternating layers so that the leaves acquire the heady jasmine aroma. The blossoms are removed from the finished tea – leaving the jasmine blossom in can deteriorate the quality of the tea and result in a bitter taste. Jasmine tea is popular in China and is often used as a welcoming gesture to guests. 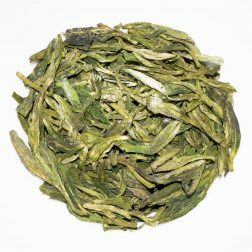 This Nu Er Huan Jasmine Girl Rings green tea is from the spring 2018 harvest. It comes in tightly rolled little silver rings that unfurl into full green buds in your tea pot when you brew them. There is a heady scent of jasmine coming from this tea on the first infusion. Subsequent infusions have a more subtle jasmine aroma. 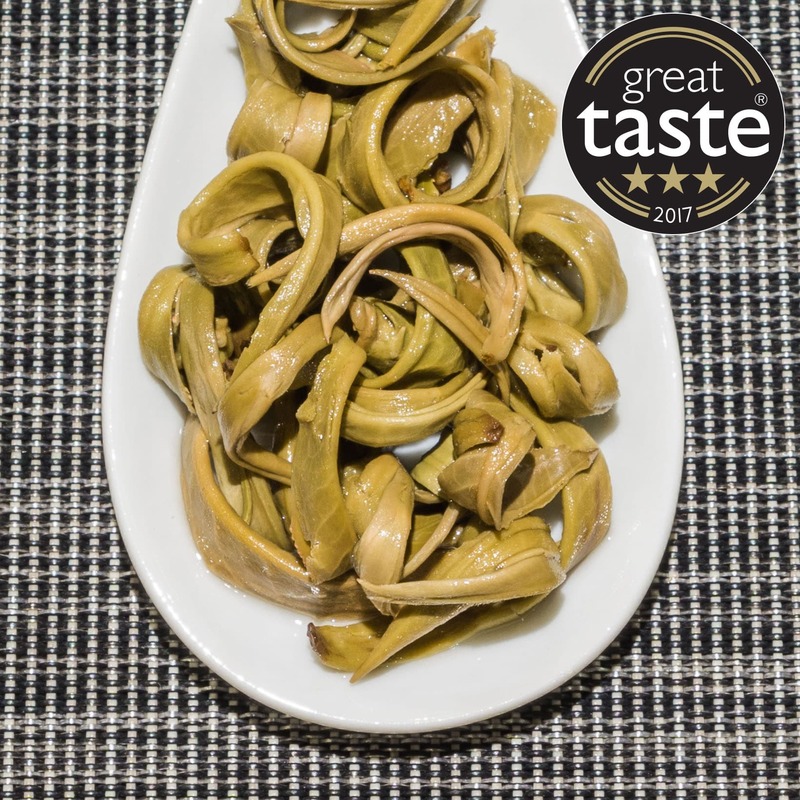 The flavour is light and smooth with sweet floral notes. 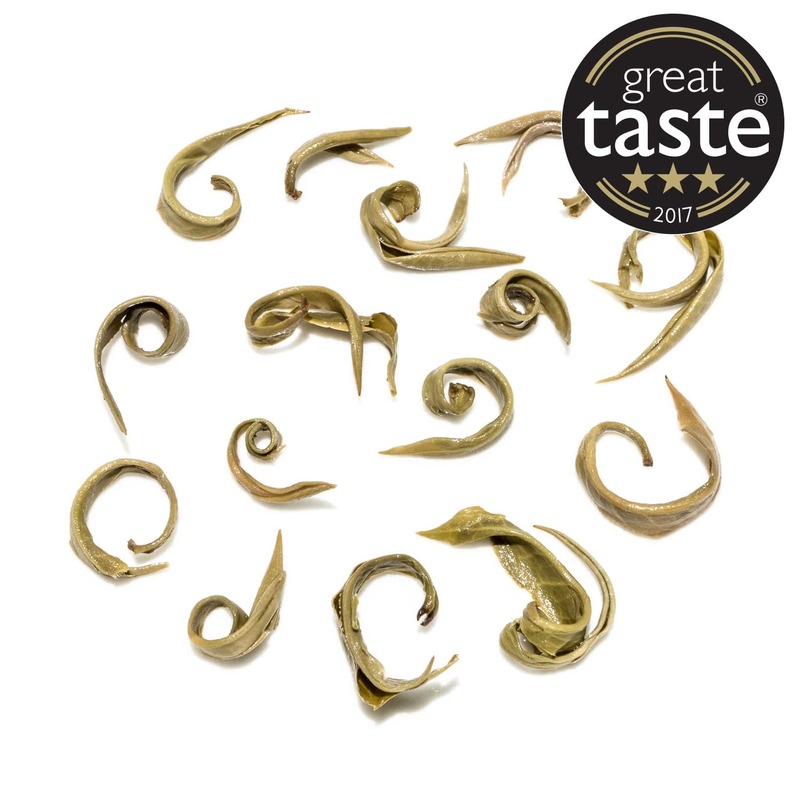 The taste is lighter on the first infusion, becoming fuller and more balanced on subsequent infusions. We suggest brewing parameters of 80°C for 2-3 minutes according to your taste. It can be brewed 3 or more times depending on your taste preference. Use glass teaware, if you can, to enjoy the beautiful unfurling leaves. 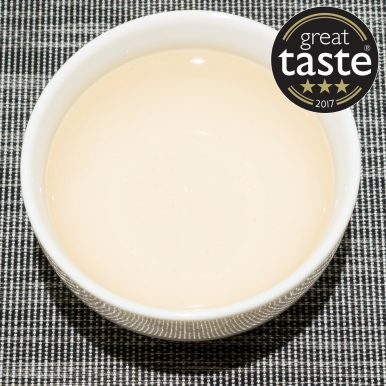 This jasmine green tea produces a very satisfying cup of tea that is pleasant to drink on its own or it also goes exceptionally well with most types of food. 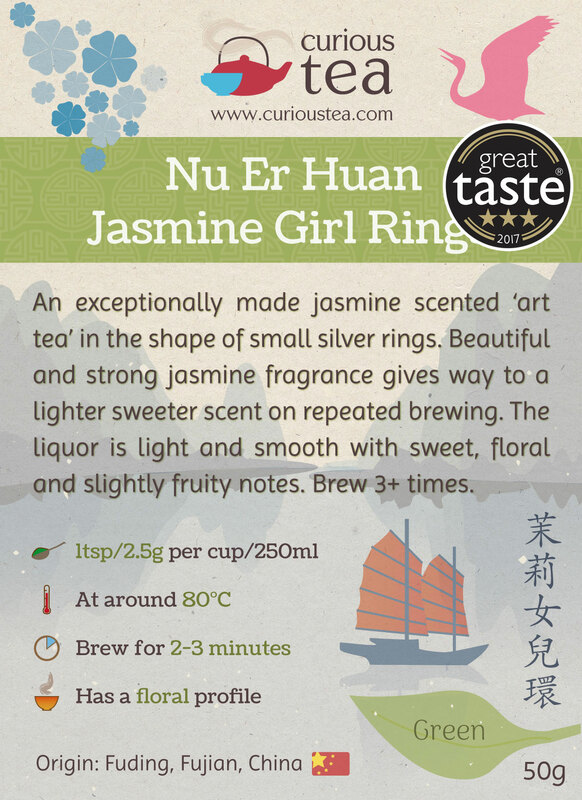 This Nu Er Huan Jasmine Girl Rings green tea was first featured in our June 2016 Curious Tea Subscription Boxes.